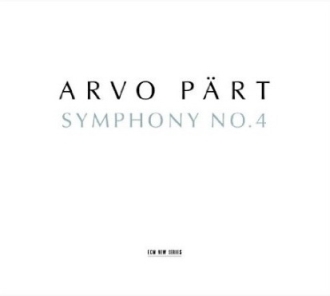 Arvo Pärt's recent Symphony No. 4 is the Estonian composer's first symphony since 1971. It is also the first since his adoption of his characteristic 'holy minimalist' or tintinnabulation composition style. Most are already acquainted with the style: a consciously simple approach to musical material, much of the time based on drones, modally-inflected scales or argeggiation, and formal repetition. The guiding aim is to evoke the natural harmonic resonances of a tolling bell, with the attendant ritualistic connotations and enticement towards a meditative state. This ECM release presents a live recording of the Fourth Symphony's premiere in LA. Commissioned by Esa-Pekka Salonen for the LA Philharmonic, the Symphony bears the subtitle 'Los Angeles', an allusion both to the site of its premiere and to the subject of its music – a sacred text on the Guardian Angel that was of inspiration to Pärt at the time. Despite good ambient balance between the right and left channels, the overall sound quality is less than excellent, owing to the recording's having been done live. But unless you're listening on headphones this shouldn't detract too much from your listening experience. The first Con sublimatà movement enters quietly with high sustained string chords. This general miasmic drift is interpolated with plucked notes every now and again on harp and resonant bell and percussion. An overall feeling pervades of the music's relaxed and unhurried approach to form, similar to Eno-esque ambient electronic music; and listening here it is not hard to see why Pärt's music has come to be taken up by Hollywood soundtracks, such as the use of Fratres in There Will Be Blood. At times in the second movement, Affannoso, the music is reminiscent of Bernard Herrman's scores for Hitchcock films: the slow-moving, dialogue-free scenes in Psycho or Vertigo, for example. A feeling of tension and dread emerges in the second movement with combatant antiphony conjuring up a fray between two distraught speakers. A plangent violin solo near the outset of the third Deciso movement leads the work towards its denouement, an understated, melodically askew march which peters out after a while to no great effect. On the whole it is not a particularly engaging work from Pärt, and it feels desultory. The other work on the disc presents fragments from the choral work Kanon Pokajanen, written in the late 90s. This is a sacred work with a strong Slavonic feel at times in the harmonies. It is sung beautifully by the Estonian Philharmonic Chamber Choir under Tõnu Kalijuste, who is a frequent collaborator with the Estonian composer. A recent release on Sony allows us to compare Pärt's latest symphony with his previous one. Pärt wrote his Third Symphony in 1971, in the middle of a six-year hiatus from composition from which emerged no other new works. Rather than compose during this period he immersed himself in Gregorian chant, the music of the Notre Dame school, and classical polyphony in general, through this self-prescribed course of study developing his tintinnabulation style. Although the Third Symphony does not follow this style – nor, for that matter, Pärt's previous avant-garde style – it does show occasional presagements; there is an austerity to the music, for instance, that invokes a sacral character. On the other hand, the music reaches a dynamic pitch – seen, for example, in the booming brass at the end of the first movement – that is alien to his later, static, quiet music. The Symphony No. 3 has a modal character which suggests an affinity with some late-nineteenth and early-twentieth century symphonic music – that of Nielsen, for example; an affinity altogether absent from the Symphony No. 4. As such, it does have something to recommend it as a contribution to the genre, albeit a conservative one. Opening the disc is the premiere recording of the revised version of Pärt's Stabat mater. This revision for chorus and strings was commissioned by the Tonkünstler-Orchester at the behest of Kristjan Järvi, the conductor here of a robust Rundfunk-Sinfonieorchester Berlin, and son of Pärt's old colleague and friend Neeme Järvi (the dedicatee of the Third Symphony). As the piece progresses, its initial undeniable beauty palls, and its effect has altogether worn off by the time of its half-hour mark end. Through the four sections, which have short instrumental interludes in between, Järvi loses the pace and lets the piece slacken. The result is disappointing and as interminable as a bad sermon. More upbeat if again uninspiring is Cantique des degrés for choir and orchestra, closing the disc and the shortest work on it at under eight minutes. The triumphal feel of the music – more extroverted than we're used to with Pärt – can be ascribed to its having been commissioned by Princess Caroline of Monaco for the fiftieth anniversary of the accession of her father, Rainier III. The haunting anachronistic feel of Pärt's music, enspiriting at its best, is here channeled towards the the sort of ceremonial pomp that makes much music of the classical period sound dead to contemporary ears. Although fine as a film soundtrack, or as background music for reading the Sunday papers, it doesn't have much to offer the engaged listener.